Are you always looking for something in your classroom? Maybe it’s that special pair of scissors, your attendance/grade book, or the long overdue library copy of Cynthia Rylant’s The Journey: Stories of Migration . I’ve asked and heard those kinds of things at one time too. And sometimes I still do. But when we are always looking for things, when teachers and kids can’t put their hands on what they need when they need it, it becomes time consuming and frustrating. Sometimes it’s easier to give up and go on. But giving up and going on doesn’t lend itself to active teaching and learning. It’s a passive stance that runs counter to developing those can-do, let-me-have-at-it kinds of attitudes we want so much for our children and ourselves. What might we do to set the stage for agency and independence? What can we do so that kids and teachers can put their hands on what they need when they need it? 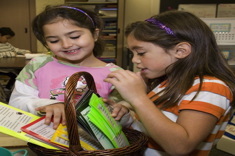 First, involving kids in the organization and placement of books and materials is a smart thing for us to consider. Kids will learn a thing or two about thoughtful organization, and because they’ve been part of the placement process, they’ll know firsthand where things are kept, why it makes sense to keep them there, and where to put things back. But we can’t stop there. We also need to discuss the why, the what for, and the how to. Let’s say we’ve stocked the writing area with paper, pencils, an electric pencil sharpener, markers, staplers, staples, and staple removers. We’ve put out the white out, paper punches, glue and rubber cement. Paper clips, sticky notes and push pins are arranged in containers just the right size. Dictionaries and Thesaurus’s stand tall on a book shelf close by, alongside tubs holding mentor texts and the current author study. If you said to yourself, “Are you kidding?” I get it. I’ve personally known children who have created blinding snow storms using an entire bottle of white out, made action-packed flip books out of packs of sticky notes, linked paper clips into lovely three foot-chains, and covered all ten fingers with rubber cement, just for the fun of peeling it off when it dries. These behaviors are precisely why we have to model, discuss and demonstrate why these things are in the writing area, what they are for, and how to use them. Once we show kids how to use materials throughout the room, we can trust them, and they can trust themselves, to make wise decisions. It’s the same with books. We can organize them, put them into tubs and thoughtfully place them throughout the room, but even that isn’t enough. We also need to do book talks, teach kids the kinds of things they might expect when reading a certain series, author, or type of text, and teach them how to choose the books they’ll read with purpose and intention. How we decide to organize books and materials says a lot about the ways we see ourselves and our students. If we want our kids to develop a sense of identity, to become problem posers and problem solvers, and see themselves as the kind of kids who can figure things out, they need access to a wide range of books and materials that allow them to do and be just that. Inviting and involving students in the process of organizing books and materials says a lot to them about what we believe about teaching and learning. It sends the message we believe in kids and value their opinions; the books and materials are ours, that this year their role in the classroom is going to be an active, participatory one. For all you early birds out there who spend most of the first month before students arrive organizing the room, stay with me. We can come back to school whenever we want! But just maybe, after we’ve arranged the room in a way that feels right for now, we can hold off putting out and organizing all our books and materials. We want to be ready for the first days of school, things like pencils, markers, scissors, notebooks and glue will be organized and accessible, but what about involving the kids in some of the rest of it? It does sound a little scary, but you have to trust that it’s probably going to look much the way it would had you done it yourself, except that now you’ve done some community building along the way, you’ve gotten some real help, and your kids know where things are. It might sound chaotic, but if we plan our work and work our plan, it doesn’t have to be. 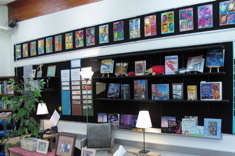 For example, from the very beginning, when students and I first begin to talk about book selection, we talk about where the books are in the room, so that they can find what they need. I might start with just five or six tubs, we label them together in ways that make sense, and then we practice. With kids in a circle, I randomly hand out books to each of them. I might say…”Start-Off Stories – everyone point where they go!” Then the kids with Start-Off Stories get up and put the books there. And so on. The same will be true for organizing and filling up the walls of the classroom – resist the urge to decorate those spaces before the children arrive. On the first day of school, the classroom walls, bulletin boards, and doors will be almost bare. That’s as it should be! Don’t jump in and “put stuff up” just to make yourself feel better. Be patient. Wait. In a few days, your students’ classroom portraits could be smiling back at you, beginning of the year interviews posted for all to see, and the “Welcome to Our Classroom sign” gracing your front door – kid-made and beautiful. In the days, weeks, and months to come, those walls will fill with artifacts and learning that are unique to you and your kids. You probably won’t have an anchor chart about the book, The Librarian of Basra but then again, you might. 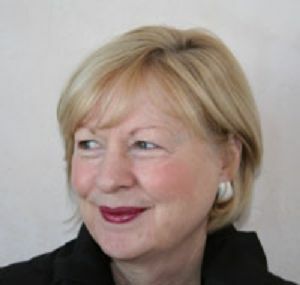 Maybe yours highlights how making connections from your reading to the world enhances understanding. Or maybe it’s something else entirely. The point is, charts, student work, and the organization of books and materials reflect the teaching and learning in your classroom. They are part of the teaching and learning, as much as any specific lessons you do on comprehension strategies or writer’s craft. 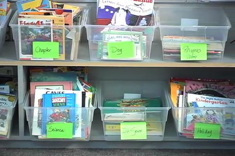 Jennifer McDonough explains why it’s important for her to share the sorting, categorizing, and labeling of texts with her students early in the year whileÂ organizing the classroom library. 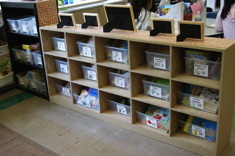 In this brief video, Joan Moser talks about how she organizes student materials in "social groups" to avoid the use of desks or cubbies in her classroom. 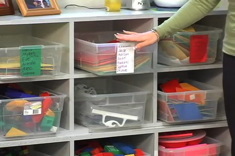 “The Sisters” (Gail Boushey and Joan Moser) talk with Kelly about strategies for reorganizing student storage areas, considering access, group supplies, and how the materials are used.